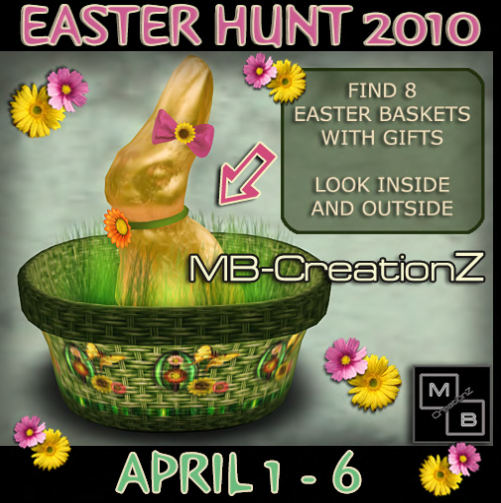 (MB) CreationZ – Easter Hunt!! Here are the RULES straight from the notecard!! 1. ****PLEASE, PLEASE, PLEASE, PLEASE**** take off all heavily scripted attachments and huds BEFORE visiting – too many scripts make the sim come to a crawl and will prevent other scripted items that depend on from working properly. Each of you can help to keep script lag as low as possible by wearing clothes and hair that don’t come with a gazillion scripts;-) I want to leave the hunt gifts out through April 6th, but when important scripts stop working because of it I will have to cancel the hunt early, which is something I don’t want to have to do. So ****PLEASE, PLEASE, PLEASE, PLEASE**** be considerate and respectful with your scripted attachments;-) Everyone will have more fun this way! 2. Please don’t ask Minke (Owner) for hints – the gifts are not too difficult to find (even though you will have to walk around because the item that holds them is small, and I will move them around once in a while. 3. Please don’t give out locations in local chat and don’t spread cheat sheets – it’s a hunt and this will spoil the fun for others. I have hidden 8 easter baskets with gifts throughout the store – there are 4 of them inside the building and 4 of them outside.